If a company is to leap forward in a data-driven marketing world, the first point on the agenda is to do away with unnecessary gatekeepers and bottlenecks. Free up our professionals to focus on what is driving true business value. If we want to architect our MarTech around the concept of Data Accessibility by design, we might have to make some drastic changes in the we think about data. Marketers look at companies like Amazon and Netflix with great admiration. Not in the least because of their data-driven tactics. We can say the ambition to become more data-driven is definitely there, but it is not so simple is it? Part of us feels it should be a struggle to become more data-driven. It should be hard, there should be sweat on the brow. Compare it with climbing a mountain. Part of that great feeling of accomplishment when reaching the top is the struggle. You did it. You were determined enough, you trained and went through it all. And now you are at Peak performance. When you want to improve how you do an ascend like that, first instinct is to get better climbing gear or hire a sherpa to help out. That would make things better, but that is completely missing the point. Because with data-driven marketing it isn’t the effort that makes creates the business value. The value is in the end result. Why don’t we do away with climbing altogether and make reaching the top easier, more accessible. How we get there doesn’t matter, so the more accessible, easier it is to reach the top, the better. What are the high performers doing? You are the average of the people you surround yourself with. So it pays to look at what the high performers are doing. A recent study by CDP vendor Lexer showed that companies that get high value from data must be sufficiently resourced. That means, you have to want it enough to invest and move to the next level. No free rides. If you want to forge a competitive edge through data, you need to prioritize it. What I find interesting is that high-performers are also much more likely to have “Self-service insights” and “Data made easy”. This is where I think we can make a difference. Access equals adoption. So we have to make the data more accessible and more actionable. Limited access to Data is a problem that can be solved. With the huge volumes of data we can now gather, the complexity and number of formats only grows with them. You can’t expect normal marketers to make sense of it on their own. This is where creating in-depth insights to accompany the data is the domain of an exclusive group of well paid data scientists and analysts. To make it even worse, the IT department is the doorman with a clipboard at club “Data Driven” and only lets a few requests in because of “capacity”. IT owning the data inherently leads to frustration, lost time and a big line outside the club, including never even submitted requests. But it’s actually not the ownership of the data being limited, it is the access to the data and corresponding insights. These stereotype roles of IT and data science are helping you climb the mountain. But we don’t want to climb the mountain anymore. Getting results should be easier. If a company is to leap forward in a data-driven marketing world, the first point on the agenda is to do away with unnecessary gatekeepers and bottlenecks. Allowing professionals to focus on what is driving true business value. Marketers are calling the process of unlocking data Data democratization. Data Democratization means that employees will have direct access to the data, when and where it is needed in the organisation. It means insights and access on demand. Stages of marketing infrastructure, use what someone else already made. What if we could use the infrastructure that someone has already built to get to the results we want? It seems crazy to me that in 100 companies, 100 teams are trying to create their own, separate, part custom infrastructure. And struggle, wasting time and money doing so. No company is a snowflake, the wishes from marketing aren’t that unique. Email marketing, ads, social media management and marketing automation providers, where first to create platforms form the tools they built. While in the early days, people were tempted to build their own tools. Today, you would never build your own email marketing system unless you had a very, very good reason. Next up is the idea marketing suite. Bundling multiple delivery channels and some of the decision making functions. It is actually quite a good idea to have these together. You can decide if one vendor fits every need you have or you want multiple best-of-breed systems. Single vendor stacks come at their own price. Seen over time, you’d want your MarTech stack to be future proof and resilient enough to face changing environments. Today we are now at the brink of the next stage. 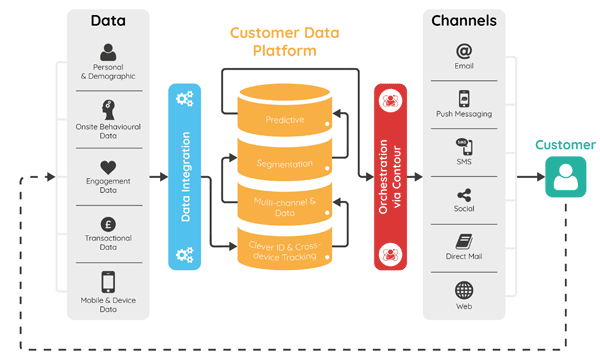 Making the data layer more accessible to systems and marketers. Data infrastructure was long kept to be an inhouse thing and limited in completeness, openness and access. But the rise of big data, an API-zation has opened the doors to a new category of Data infrastructure software called CDPs. For those unfamiliar with the lingo, a CDP is a pre-packaged system that creates a persistent, unified customer database that is accessible to other systems and is marketer-managed. I have written before about the definition of a CDP and the differences with CRM, DMP and other data systems The key terms here are Data Access, pre-packaged and marketer-managed. Bring together separate data sources through a pre-packaged system. Data is naturally captured at several touchpoints and (thus) in multiple systems. The number of sources is only expected to grow, because of further digitalisation and growth of IoT. To connect the dots and make the data speak to us, we have to bring these data-points together in a meaningful way. This is a different approach than system to system integrations (linking two systems together). The outset is to make a central hub and bring the data together there and have the hub be open to in and output. In a CDP the data merge functions that are able to connect multiple systems come pre-packed. If it is a true CDP, the whole system is set to be open and connected with data sources. Little assembly required. The system should also be connected to the delivery systems, if that is internal for analytics or delivery of messages to the customer. Your in-house data of identified customers a is what we normally think of when talking company databases. That is the data found in CRM, Marketing, ecommerce systems. The data layer is to also bring in unidentified customers, third party data and don’t forget the power of product data. Adding more data is called data enrichment. Brands can get richer results when they add useful data and identify new audiences, and get a deeper understanding of their customers. A CDP must be open to all systems to combine the data in a central place. This is one of the ways that a CDP is different from technologies like CRM or DMP or systems that use data for their exclusive internal use. For instance an email marketing or marketing automation tool, can do interesting things with the data generated inside its own application, like change email frequency based on engagement levels. But a single system will always be limited if there is no centralization and open access to data. Like the image above illustrates, there are different moving parts in navigating MarTech. 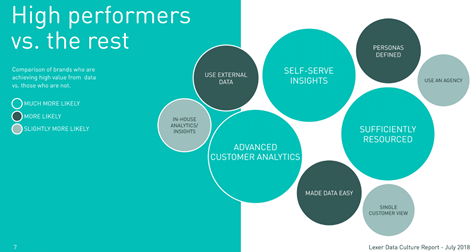 The functionalities to unify, transform, predict and a data onboarder function take care of those. This relieves the sherpa function of IT to build and customize integrations. In other words, the data is accessible by design. After the data has come together, and certain insights produced, marketers still need an interface to use the data directly. A CDP should be marketer-managed. Where marketers can directly manage that data, make your own counts, segmentation, tribes on the fly. Customise and drill down into the data with dashboards, dig up insights or (dis) prove a hunch. The consequence of Data democratization and better access, is a shift in data use. MarTech is starting to catch up to the ambitions of data-driven organisations. But what about the insights that takes highly trained data scientists? Just like you once needed to be a programmer to create a website, premade workable CMS and Themes now make that most can create a good looking site without knowing all the ins and outs. Without all of the extensive training. Gartner predicted that the number of citizen data scientists will grow five times faster than their highly trained counterparts. A Citizen data scientist has some data science-like skills. You must know statistics and the ground levels of data use, but certainly not as advanced as a data scientist. This is much in line with the idea of a T-shaped marketer. You know enough in broad areas and specialize in one or two. A citizen data scientist can create and deploy basic models to gain insights. Access to the data means that all employees have the opportunity to become data-literate. More empowered to make data-driven decisions. Martech is helping to prepare and pre-bake insights and analytic predictions. And although the whole CDP segment is still developing (meaning it is not a magic wand… yet), the cable cart is already there.